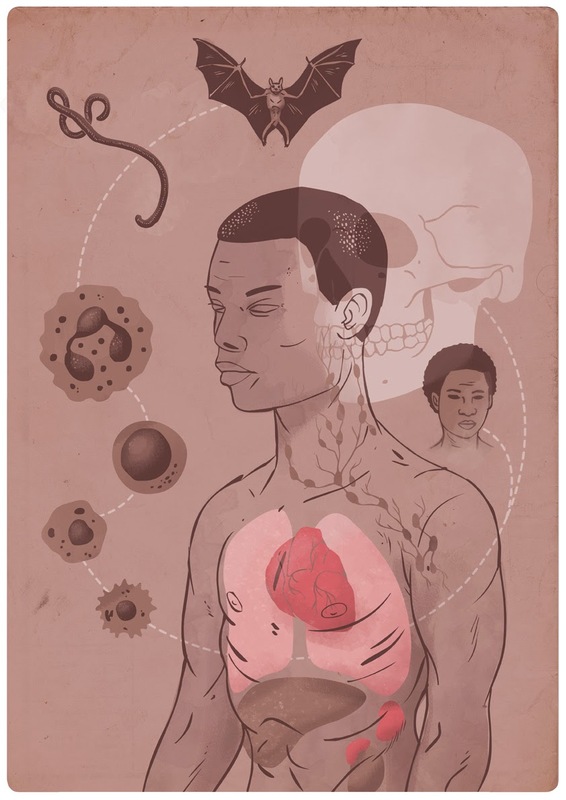 DESCRIPTION: The West Africa Ebola outbreak was one of the biggest health catastrophes of 2014 and is still ongoing, which is why I chose to submit this art work titled 'The Path of Ebola' to the third edition of Illustraciència. West Africa is currently slowly recovering from the epidemic but still needs outside help. I hope to bring some awareness to the matter through my art. Even with such a deadly virus, I believe it does not stop one from illustrating its cycle and pathogenesis in an artistic yet informative way. There is beauty in nature, even in the morbid side. The illustration shows the transmission of the Ebola virus from a fruit bat to the inside of the human body; its route to the neutrophil, macrophage, NK and dendritic cells. The virus attacks the internal organs, multiplies and continues its path to other recipients, in the process often killing its previous host.